Here in the northwest our weather has been on the warmer side. When I say warm I actually mean H-O-T! Did you know that a lot of homes here do not have air conditioning? It's true! Most of the year it's definitely not necessary, but these last few weeks (maybe even month?) have really had me wishing for it. Trying to stay cool at home has been a fine balance between art and science. Knowing when to keep your blinds shut and when to open the windows, to the strategic placement of fans. We've got our little system in place. Most importantly is how we keep our bedroom cool and comfortable during these hot days. From the ac unit in the window (we had to for our sleeping sanity!) to a lighter set of sheets and some soothing scents. A few tweaks here and there make all the difference to a good nights sleep despite the summer heat. 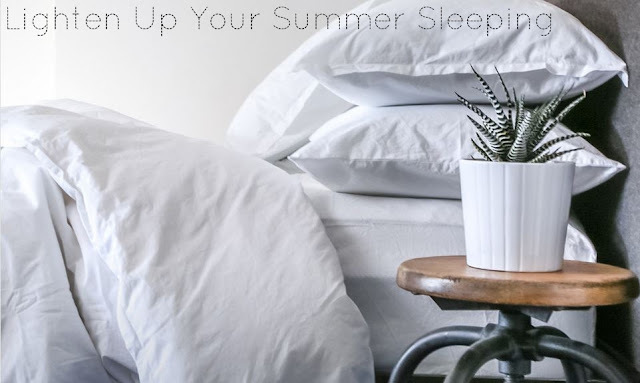 Here are my must haves and tips 'n' tricks to achieving a cool and restful sleep during summer months.